For latest information on services, roads, tours and events, please call Tourism Association president, Bill Elliott, on mob. 0429 915467, or enquire via the contact form. This section includes stories, photos and articles of wildlife and country around Wilcannia -- Barkandji country. 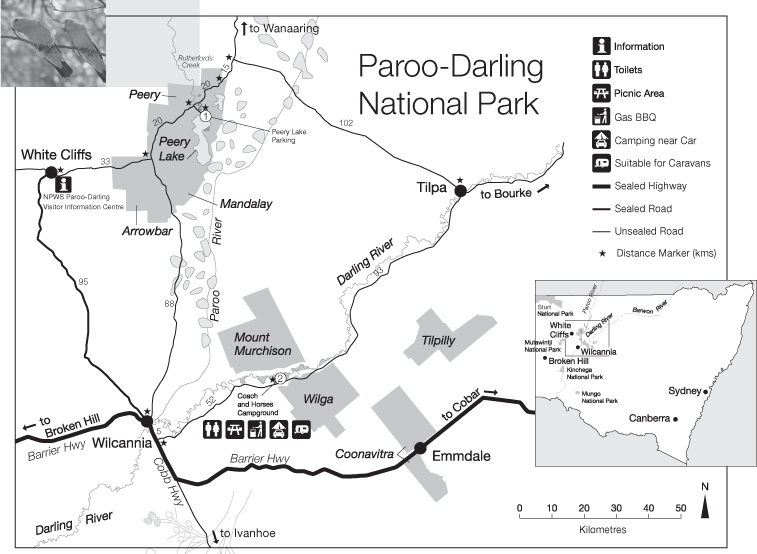 Also gems and opals from White Cliffs, and other geographical sights and attractions in and around Wilcannia. The Coach and Horses campground is open all year round. This exception is that this area is susceptible to road closures due to flooding and rain. In a delightful, shady spot next to a bend in the Darling, the Coach and Horses campground offers a bush camp with views up and down the river. Spend the day exploring the river in a kayak or canoe or enjoy a spot of fishing. If you’re walking along the banks of the river, be sure to keep an eye out for the local birds. Wilcannia has a rich variety of bird life, with flocks of Red-Tailed Black Cockatoos frequently in the trees and on grass areas in Wilcannia. 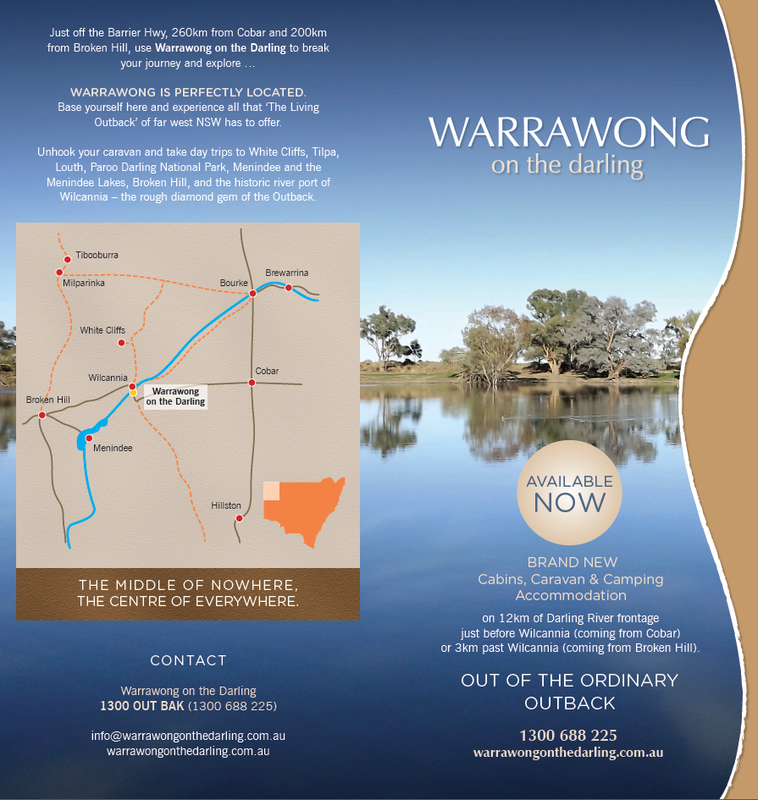 Warrawong on the Darling is located on the banks of the Darling River and offers modern cabins, powered caravan sites (some with water frontage) and bush camping. More pictures and profiles soon. 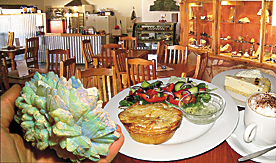 The restaurant features a large display of opals mined from the local area. 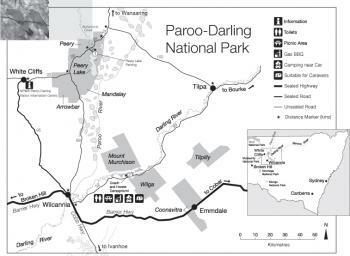 ** Due to recent heavy and consistent rains in the Wilcannia region (over summer, 2011-2012) we should expect to see "acres of desert peas" when in season (best along the White Cliffs road). More details as they come to hand. We'll post a front-page news item when appropriate. 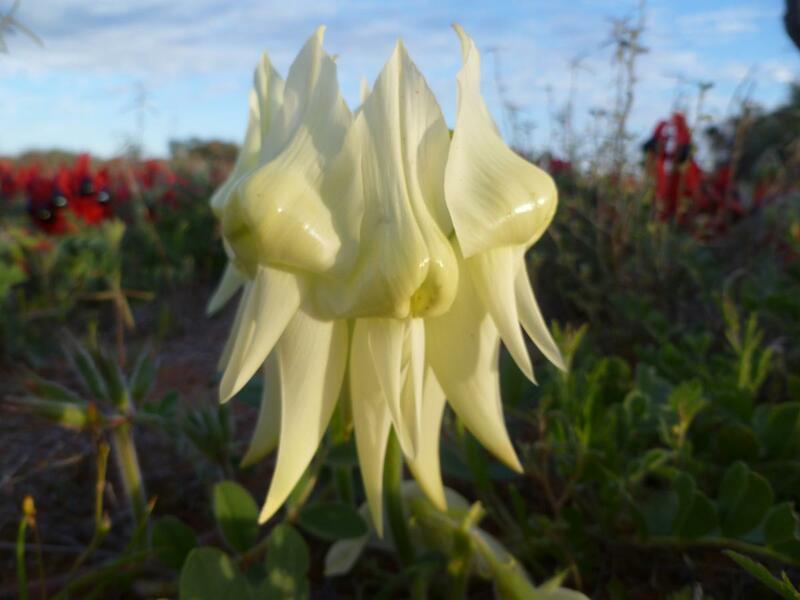 wainsona formosa, Sturt's Desert Pea, is an Australian plant in the genus Swainsona, named after English botanist Isaac Swainson, famous for its distinctive blood-red leaf-like flowers, each with a bulbous black centre, or "boss". It is one of Australia's best known wildflowers. It is native to the arid regions of central and north-western Australia, and its range extends into all mainland Australian states with the exception of Victoria. Specimens of Sturt's Desert Pea were first collected by William Dampier who recorded his first sighting on 22 August 1699. These specimens are today in the Fielding-Druce Herbarium at Oxford University in England . The taxonomy of Sturt's Desert Pea has been changed on a number of occasions. It was initially treated in the 18th century in the genus Clianthus as Clianthus dampieri, and later became more widely known as Clianthus formosus (formosus is Latin for "beautiful"). However it was later reclassified under the genus Swainsona as Swainsona formosa, the name by which it is officially known today. 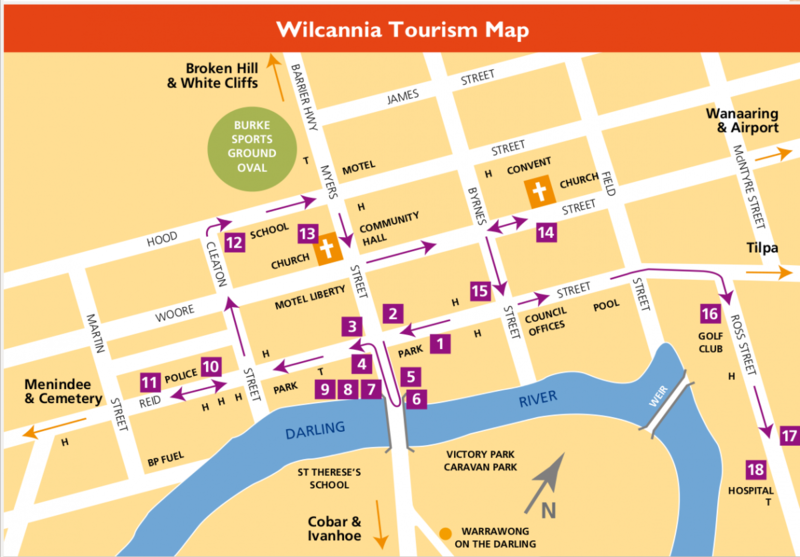 Welcome to the Wilcannia Tourism Association's website. Wilcannia offers a stunning display of beautiful heritage building, including the local hospital, (old) post office, council chambers, police station and courhouse, to name a few. Wilcannia wildlife is also rich and diverse, particularly the birdlife. "Mobile ready"1 will be particularly beneficial for anyone seeking useful information using a mobile phone or tablet2 - with information being presented at standard font-sizes, with content and text wrapping and stacking verticaly.